Do you follow Pete Souza on Instagram? If not, you totally should. He is the current White House photographer for President Barack Obama and this past week he was in Kenya and Ethiopia with the Commander in Chief. This was the first trip for Mr. Obama to Kenya as President and he also made double history as the first sitting U.S president to visit Ethiopia. President Obama receives a bouquet of flowers as he arrives in Kenya tonight. President Obama and President Uhuru Kenyatta of Kenya listen to the U.S. national anthem during a ceremonial welcome at the State House in Nairobi, Kenya. President Obama, with President and Mrs. Kenyatta, signs the guest book at the State House in Nairobi, Kenya. President Obama in Nairobi, Kenya. Watching the President board Marine One in Nairobi. President Obama, an avid tea drinker, samples some Ethiopian coffee at last night's State Dinner hosted by Prime Minister Hailemariam Desalegn at the National Palace in Addis Ababa, Ethiopia. President Obama views "Lucy," the 3.2 million year old fossilized bones of a human ancestor, last night at the National Palace in Addis Ababa, Ethiopia. 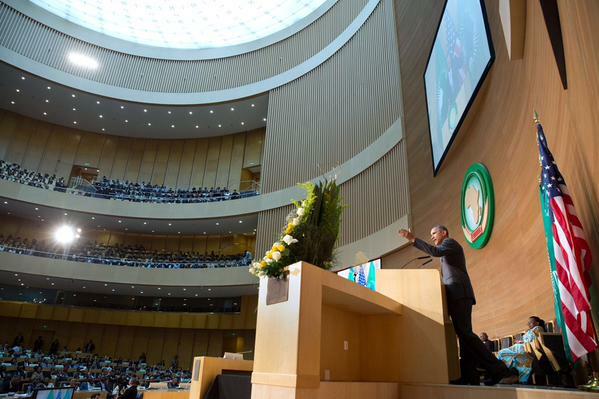 President Obama speaks to the African Union in Mandela Hall, Addis Ababa, Ethiopia. So long Africa. Homeward bound from Ethiopia.